Hi guys. How's it going? Yes, I am back with another post today! 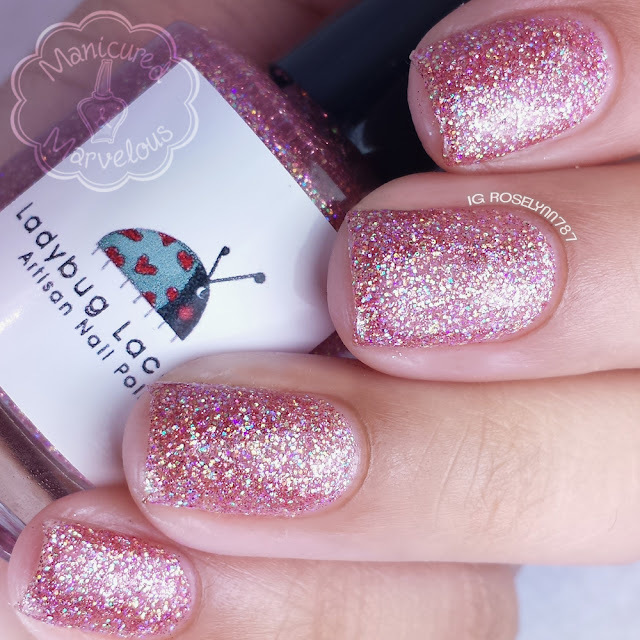 Ladybug Lacquer is a brand new indie making its debut with two collections, one of which is the duo I will be showing here. Now before we get started, I do want to note that Ladybug Lacquer will be different from other indie brands in that with every bottle purchased a portion of the proceeds will go to help victims of human trafficking. This is such an ambitious and amazing way to raise awareness to a large issue, I applaud their stance and will definitely be a long-time supporter on that basis alone. Ladybug Lacquer will be launching on Monday May 25th, but there will be a pre-order period launching on Friday May 22nd. Rose Quartz is a rosey pink with iridescent and holographic glitters. This is a really stunning soft shade and the glitters really make it glisten. It's not a shade I normally wear, but the slight texture makes me more drawn to it than I otherwise would be. The formula is a bit on the thick side, causing a bit of strain to layer the second coat evenly. I found it best to dab on additional coats for an even opaque finish. As I mentioned this is intended to be a texture polish, but a layer of topcoat will lessen the effect. Swatched here is two coats with a thin glossy topcoat. Smokey Quartz is a rich brown with lots of micro holographic glitters. This is such an earthy and deep tone, I love it. You don't see very many browns that can take your breath away, but the holo glitters in this one really make it look gorgeous. The formula on this one was a little bit thinner and therefore didn't really need any dabbing. The texture even before adding topcoat was too apparent, so I would suggest an additional coat for the full effect. Swatched here in two coats and sealed with a thin layer of Seche Vite topcoat. Overall I think Ladybug Lacquer is off to a great start for being a brand new indie business. I'm always personally a fan of texture polishes done right and that's exactly where this duo falls into. I wish Rose Quartz wasn't so thick, but even so it's not what I would call unworkable by any means. That said, I'm definitely looking forward to swatching the other debut collection later on this week! Beautiful polishes and a great cause! Great swatches! These are interesting, I'm sure they are killer in sunlight! Very cute polishes! Rose Quartz is lovely! Beautiful swatches! I can't wait to see the swatches of the other collection. They look very pretty as well. These are really pretty. I don't tend to like micro glitter bombs or textured polish, so they aren't for me but I love that they are raising awareness for a much larger and worthwhile cause! Love those iridescent glitters. So pretty! Smokey Quartz is my favorite! Both of these polishes are gorgeous, and I also applaud such a worthy cause! Smokey Quartz is insanely gorgeous, even though it has a brown hue. The glitters are so nice! A great cause! I like the brown more than I expected I would. wow those macros are insane!! great job! These are gorgeous! I'm loving Smoky Quartz! Oh these are so pretty! 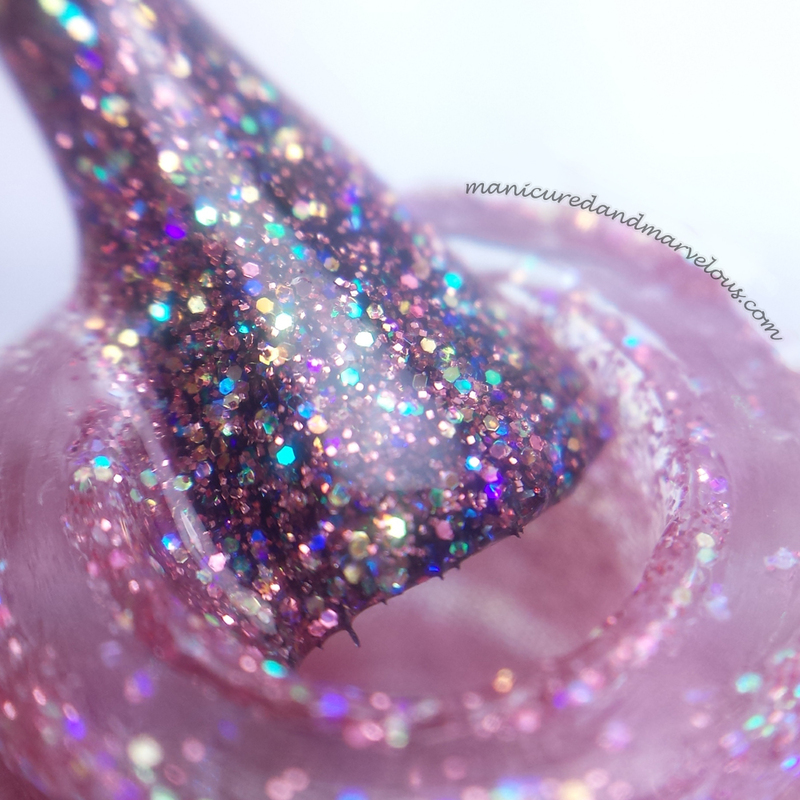 I love your macros, they show the beautiful mix of glitter so well! I especially love Smokey Quartz. So pretty! I've been following this brand since I first saw the adorable logo. I'll have the Desert Days Collection up later this week! Smokey Quartz would be my pick of the two! I really need to try this brand. Yet alone, the mission of this brand is amazing. I love that they donate their proceeds to charities and for human trafficking nonetheless. That's something I have become pretty passionate about so this will definitely be a brand I want to check out!!! Beautiful swatches!